This Carlisle 3690504 yellow 35-qt. 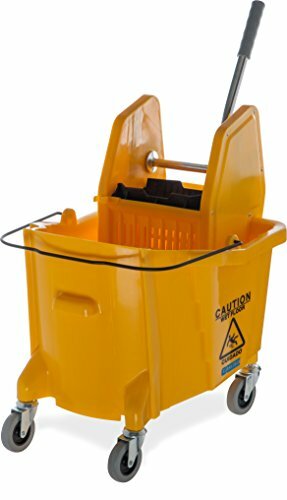 capacity mop bucket has a compact design and a down-press wringer to extract excess liquid from a mop and funnel the liquid back into the basin. The bucket and wringer are made of polyethylene for durability and corrosion resistance, and have four non-marking casters for mobility. The overall dimensions of the item are 20-1/2 x 16-1/2 inches (length x width). Mop Dual Bucket with Side Wringer, 4 gal.